Why Won't You Grow?! : Is everything old new again? I had a good time this past Saturday with some old friends. Old Navy and ER came down and threw an honest-to-goodness wedding reception two months later for all of her former colleagues and slacker friends who didn't bother to trek up to Vermont in March for the big wedding day. Sure, there were lots of "other" people--like Old Navy's Ohio/Michigan family and assorted others, but it was us (the aforementioned former colleagues and slacker friends) that mattered most. Everyone dressed up really nice for the occasion. The weather was great and the food was also pretty good. It was nice to see old friends who have moved away and some that I don't see as often as I would like. Unfortunately, as is true of what I remember from my own wedding reception, you talk to people but don't have enough time to really "talk" to everyone and catch up. So, I come away a bit dissatisfied, feeling that I wasted an opportunity. Tonight, however, I took advantage of an opportunity. To avoid working (which is sitting in front of me right now taunting me mercilessly) I started going through our picture stored in My Pictures. I don't know about you, but the My Pictures folder is a mess--unorganized, unlabelled, unkempt. So, I started plowing through the last five years of digital images--basically the bulk of the pictures that we have taken since having children. 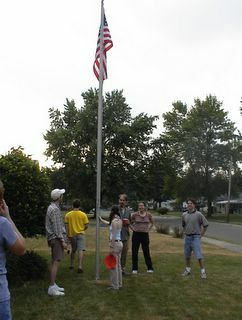 This was taken at our old house and captures a moment of patriotism amongst my friends. I used to have all kinds of parties at the old house and hope to keep on having them. This particular party was around the Fourth of July, which explains the moment of reverence for Old Glory. Then we went back to playing Frisbee. I think Tegan took the picture, but I don't know who was cut off on the left side of the frame. Then from left to right you see former colleague CFish (as Shirtless recently dubbed him), me in yellow, former colleague SBeck, Jack Thunder and Cordelia, and a rare Perk sighting. Here is Ariel photographed around May or early June in 2002. 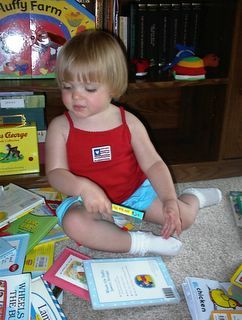 She was almost two at that point and was stubbornly holding onto her "baby fat." Ruth is currently at the age that Ariel is shown here and discounting for the straight or curly hair, there are strong similarities in their appearance. Ariel has grown a lot taller in the last three years and now, of course look more like a young girl than a toddler. Ariel always loved to surround herself with books, much more so than Ruth ever has consistently wanted to. But to each their own. And, now I will try to work . . . or maybe I'll just watch American Chopper on TV. Ah, life is full! Yes, life is full. Beautiful family, beautiful friends, beautiful pictorial past, beautiful weather, beautiful slacker gathering!